Destroy Flocks of Enemies! Basic Battle Systems and Demonic Tactics! 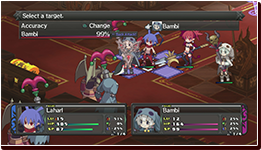 Battles are fought strategy RPG-style on a gridded map. 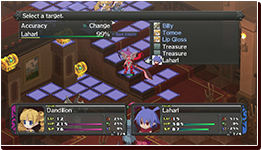 Turns alternate between the player's and enemy's turn, in which all units per side get to act on their turn. Battles and winning are simple! Approach your enemies, beat them, and... Win! Of course there are going to be stronger enemies, but use demonic tactics to achieve victory! Demonic Tactics! Team Attacks and Combos [Team Attacks] Battle 101: Fight one on more than one to your advantage! When attacking an enemy, move ally characters next to the attacking character. This can cause the ally characters to join in on the attack! (Picture 1) Team attacks don’t count as actions for the allies, so this is a very efficient and effective way to deal damage!  If ☆ is the attacker and the green characters are allies, there is chance to trigger a team attack! [Combo] If you are going to attack the same enemy, do it in a row and with the same use of Execute. You will deal bonus damage depending on the number of consecutive attacks! [Side Attacks and Back Attacks] By attacking enemies from the side or back, you will deal more damage. Also, if you attack an enemy from higher ground, you will also deal more damage. Find the perfect spot to attack enemies from to gain an advantage! Always look for a weak spot!